The FS3 combines AJA’s industry-proven frame synchronization with high-quality 4K up-conversion technology to seamlessly integrate SD and HD signals into 4K workflows. AJA’s adaptive scaling algorithms, paired with our well-known conversion technology ensures your up-converted images will have the maximum quality possible. Input SD or HD resolution SDI via BNC or Fiber and send up-converted 4K to multiple BNC and Fiber outputs simultaneously. 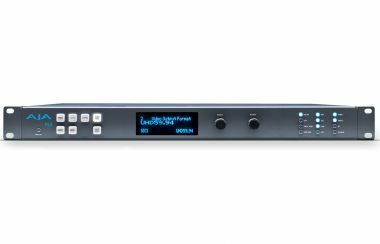 FS3 also includes the industry-proven features included in AJA frame synchronizers such as RGB color correction, region of interest scaling, extensive audio controls and routing, web UI control, GPI triggers and more.